Kyle Kashuv, a junior at Marjory Stoneman Douglas High School in Parkland, Florida, emerged as the most prominent pro-Second Amendment voice among students there after the shooting at the school that left 17 dead. Kashuv, 16, who has been embraced by many conservatives, hopes to debate David Hogg, 17, a Stoneman Douglas senior. Hogg is one of the most visible liberal voices among the Parkland students in the media spotlight. The son of an FBI agent, he has been lionized by the left as he advocates more gun control. By contrast, Kashuv does not get nearly as much media exposure as Hogg or other liberal-leaning Parkland students. His appearances typically are limited to Fox News Channel among the larger media outlets. Charlie Kirk, founder and executive director of Turning Point USA, argues that Kashuv is a worthy opponent for Hogg and other young liberals. Kyle is absolutely brilliant and deserves a chance to debate David Hogg in an open forum. David has insulted us gun owners enough, and Kyle deserves a chance to get his ideas out to the most amount of people possible. CNN recently canceled a segment with Kashuv, apparently after someone there took offense to one of the teen’s retweets on Twitter. Stoneman Douglas junior Cameron Kasky agreed in an appearance on “Fox News Sunday” to debate Kashuv, but later backed out. Kasky is credited with being a main organizer of the anti-guns March for Our Lives held March 24 in Washington, D.C.
Kashuv and other conservative voices were not given the opportunity to be heard at the march and rally in the nation’s capital. 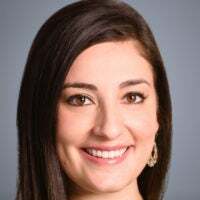 These excluded voices included Hunter Pollack, 29, whose sister Meadow, an 18-year-old senior, died in the shooting. Their father, Andrew Pollack, has become a high-profile advocate of improved school safety. So far, Hogg has not agreed to debate Kashuv. Hogg repeatedly has gone after Sen. Marco Rubio, R-Fla., for accepting contributions from the National Rifle Association, including at a “CNN Town Hall” held Feb. 21 and at the March for Our Lives rally March 24. “I’m going to start off by putting this price tag right here as a reminder for you guys to know how much Marco Rubio took for every student’s life in Florida: $1.05,” Hogg said onstage at the rally, referring to the Republican senator from Florida who ran for president in 2016. 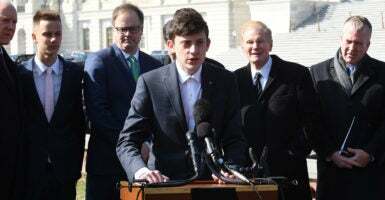 Kashuv, who has traveled to Washington several times since the massacre, continues to meet with Rubio and other lawmakers and officials on both sides of the aisle. He promoted the STOP School Violence Act of 2018, which the House passed March 14, a month to the day after the shooting. The Senate has yet to act. This bill invests in early intervention and prevention programs in our local schools, so that our communities and law enforcement can be partners in preventing violent events from happening. We need to give students, teachers, and law enforcement the tools and training they need to identify warning signs and to know who to contact when they see something that is not right. Besides meeting with lawmakers from both parties at the Capitol, Kashuv has met at the White House with both President Donald Trump and first lady Melania Trump. Kashuv is a regular on Twitter, calling balls and strikes and engaging in policy discussions with two mentors, Kirk and Ben Shapiro. Shapiro, editor-in-chief of The Daily Wire, is a well-known conservative political commentator. His popular podcast, “The Ben Shapiro Show,” is entering the radio arena. Hey. I hear @charliekirk11 wants to debate you. As you said you'd: "happily discuss with other conservative students"
Kirk and Kashuv participated in “man on the street”-style interviews during the March for Our Lives in Washington. Kashuv also provided some commentary on Fox News Channel during the event. Kirk interviewed Trump at the “Generation Next” forum held March 22 by the White House. The forum, designed to engage millennials, focused on the economy, free speech, and the opioid crisis. During that forum, Kashuv spoke with The Daily Signal’s Rachel del Guidice about the relative media blackout he faces for defending the Second Amendment. He also gave advice to students with similar beliefs.